This week’s Assorted Nonsense… Larry McMurtry and the Great Novel. Just me talking to myself again… this time about image and self-promotion. “How’d the book launch go?” somebody asked me the other day. There aren’t enough superlatives in the English language to answer that question. Sephora Hosein introducing me at the launch. All completely true. Certainly the beginning of an answer. It’s been kind of a strange year. I broke my ankle in January. At the time I thought, well this is kind of bad luck. Is that what kind of year this is going to be? This is the year my novel A Time and a Place is supposed to come out. Is this a bad sign? Of course, any rational person knows that breaking your ankle in January and having a book come out in October have absolutely nothing to do with one another. Thinking that an event in January (never mind that it happened on Friday the 13th) might set the tone for an entire year is clearly ludicrous. I like to think of myself as a scientific rationalist. I don’t usually indulge in such thinking. Anyway, it turned out that breaking my ankle wasn’t all that bad. Courtesy of the Canadian Healthcare System, I received first class medical care. Afterward I was able to work from home. I got lots of sleep for a change. I watched a few movies I wouldn’t otherwise have been able to watch. I got to spend more quality time with my wife and family. As the year progressed, other good things happened. My ankle healed nicely. I got seconded into a nifty new position at work. My book edged ever closer to publication, and I began planning the book launch. I was determined to get the launch exactly right. Not just for me and the book, but for anybody who might show up. I didn’t want to waste anybody’s time. Truth be told, the launch became a source of some anxiety. I don’t throw a lot of parties. A handful in my life. 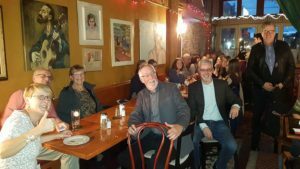 For my fiftieth birthday, for example, I’d always thought I’d throw a big party, but when the time came, I settled for a quiet dinner with my family and a couple of close friends. I wanted to go bigger for the book launch. I figured it might be the only one I ever have. It was to mark the culmination of several years of writing a novel that for the longest time I wasn’t sure I’d ever finish. Twelve years of hard writing preceded by many years of false starts and dead ends. I wanted to mark the end of that long journey appropriately somehow. 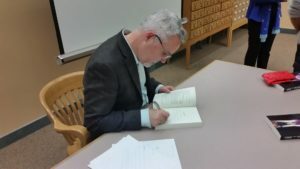 I read blogs and articles and talked to fellow writers about how to hold a proper book launch. I discovered that such a launch is supposed to be more than just a celebration of finishing a book. It is, as the name suggests, supposed to launch the book, propel it forward into the great wide world. From a marketing perspective, the idea is to make as big a splash as possible to give the book the absolute best chance to succeed. You want as many people to come as you can manage. It may sound a bit crass, but the fact is you also want to sell as many copies as you can. Some big decisions had to be made. Where to hold the launch? Four immediate possibilities came to mind: home, a bookstore, a pub, or a library. I didn’t want to have it at home because my house isn’t big enough. It’s also too far away from downtown Toronto. And it wouldn’t have lent the event any cachet. I wanted the launch in Toronto where it could generate the biggest possible turn-out. As for bookstores, the most appropriate would have been the science-fiction and fantasy bookstore, Bakka-Phoenix books, but I didn’t feel comfortable approaching them because I didn’t have a relationship with them. As for pubs, I could think of a couple that might have worked, but I wanted a location with more significance. 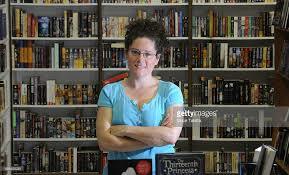 I approached my friend Annette Mocek, a librarian at the Merril Collection of Science Fiction in the Toronto Pubic Library on College Street. She passed my request onto Lorna Toolis, Head Librarian at the Merril, who discussed it with the Friends of the Merril Collection, and I was thrilled when they agreed to host the launch Thursday evening Oct 26th. A Time and a Place is a science fiction/fantasy adventure; other than Bakka/Phoenix Books, there really was no more appropriate venue in Toronto. Lorna, who has hosted many book launches, suggested I approach Bakka-Phoenix Books about selling copies of A Time and a Place at the launch. I felt awkward about this because, as mentioned above, I didn’t have a relationship with them. I live in Whitby, well outside of Toronto, and Bakka-Phoenix Books is located too far from where I work in downtown Toronto to make it easy to drop by. Bookstores are often approached by new authors seeking help, whether it’s to sell their books on consignment or hold a book launch or what have you, and they are understandably skeptical when approached by authors who, as far as they know, have never frequented their store. I had in fact visited Bakka-Phoenix when it had been located on Queen, and I’d also met the manager, Chris Szego, at a conference, but it was unlikely that she’d remember me. Still, I steeled myself and undertook the long walk up to their current location on Harbord, just off Spadina, about fifty minutes away from where I work. I was just back on my feet after recovering from the broken ankle—it was a good test of the freshly healed foot. I still had a bit of a limp, and the bad foot wasn’t quite pointing in the right direction yet, but it got me there. Chris was there when I limped in. I began by asking for some recommendations. Chris suggested two books, both of which I bought (Company Town and Ancillary Justice). I did this because I wanted to give her business before asking something of her, but also, I was not going to visit a science fiction bookstore without purchasing some science fiction. I mean, seriously. Afterward, still feeling awkward about the subject, I brought up the business of the book launch. To my delight, Chris immediately agreed to help out, possibly because the Merril Collection was already behind me. We resolved to connect again when we got a little closer to the date. I had one small concern about hosting the launch at the Merril Collection. 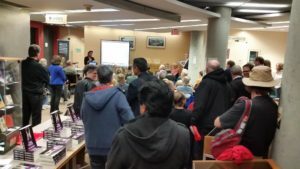 Because it’s located within the Toronto Public Library system, and is a collection of valuable SF materials, we could not have food or drink in the venue. This bothered me because I felt badly about inviting a bunch of people to come celebrate with me only to offer little in return other than a bit of speechifying and a brief reading. My friends Ann Jansen and Dave Carley suggested I invite everyone out for drinks afterward, but my wife and daughters would be along, for whom there would be school and work the next day, so that wouldn’t work. Dave suggested a pre-party. I immediately latched onto the idea. Ann researched some possibilities, and we settled on the Free Times Café, just down the street from the Merril Collection on College. The owner of the Free Times Café, Judy Perly, booked the Bistro part of her restaurant for me, and I pre-ordered a few platters of food for everyone, without any idea how many people might show up. I told Judy between ten and seventy. There was still work to be done. By this time, I had been introduced virtually to Sephora Hosein, who had taken over as Head of the Merril Collection upon the retirement of Lorna Toolis. Sephora assured me that we were still good to go. One month out, I sent out invitations to everyone I could think of who could conceivably be interested. Rather than one mass mailing, I sent personal invitations to everyone, using a template for the details, but personalizing each invitation. This took many hours but was absolutely worth the effort. For one thing, making the invitations personal felt right and good. I tracked it all on an Excel spreadsheet so I’d know who I’d invited and who responded. I invited about two hundred and twenty people, almost all of whom I knew personally. Well over one hundred people responded. About eighty said they planned to come, twenty declined, and another ten or fifteen said maybe. Just for fun, I also invited the Mayor of Whitby, where I live, and the Mayor of Summerside, Prince Edward Island, where much of the novel A Time and a Place is set, and where I hail from originally. 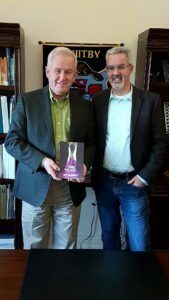 The Office of the Mayor of Whitby wrote back declining the invitation, but proposed an invitation of their own, that I come to meet the Mayor, Don Mitchell, so he could purchase of a copy of my book. Delighted, I agreed to meet him the afternoon of the launch. The Mayor of Summerside wrote back personally and offered to purchase a copy of the book, so I sent him one. I didn’t charge him for shipping, so I lost money on that purchase, but what the heck, it’s my hometown Mayor. I also promoted the event on Facebook and Twitter, as did the Merril Collection and my publisher. As well, I placed posters, created by the Friends of the Merril Collection, on every floor of the CBC Broadcast Centre, where I work. Neither the owner of Five Rivers Publishing, Lorina Stephens, or the Senior Editor of Five Rivers, Robert Runte, could make it to the launch, so I asked each of them if they’d mind making a short video of themselves saying a few words. They both agreed and sent me a couple of minutes each, which I edited together in a single video for the event. Fast forward to the day of the launch. Everything was booked. I had a short speech prepared that I’d gone over several times, along with a short reading. Together, they would take less than fifteen minutes to deliver. I didn’t want to bore anyone. It was shaping up to be a good day, though of course there was still the possibility of disaster. It was entirely conceivable to me that no one would show up. In fact, starting that morning, I started receiving emails from people expressing their regrets for various reasons. For one thing, it turned out I’d booked the launch on parent/teacher interview night in Toronto. I’d taken the day off work so I could concentrate on the launch. My wife, (Lynda) and I hung out in the morning. It felt like an ordinary day. I wasn’t that nervous; I think all my elaborate preparations had a lot to do with that. I packed the car with boxes of my book. Seventy-eight copies; I figured that ought to do it. I had just written, “To Mayor Mitchell, fellow science fiction” when he jokingly asked Lynda what it’s like living with a temperamental artist like me. It had been my intention to write, “To Mayor Mitchell, fellow science fiction fan,” but placing a comma after science fiction messed it up. Darn it, I thought. I’ve screwed this up. While Lynda answered his question, I quickly worked out a possible solution. Despite my blunder, the meeting was a great prologue to the launch. After meeting Mayor Mitchell, we collected our daughters and headed into Toronto. Annette met us at the Merril Collection and helped us carry the books upstairs. I gave her my laptop so she could hook it up to the projector. Here I encountered the first (and only) heart-stopping glitch of the evening: I couldn’t log into the laptop. Kept getting either the password or the username wrong. All the while thinking: well, I guess we could skip the video. Except, I really didn’t want to—Lorina and Robert had gone to a lot of trouble to film themselves for me, and I was certain the videos would add a lot of value to the evening. Finally, after about twenty tries, I got it working. Messing with the laptop made us about ten minutes late to the Free Times Café. Several guests were already sitting in the bistro section that had been reserved for us, but they didn’t all know one another and were sitting separately, so I set about introducing them to one another. Soon, the entire bistro except for one booth was packed with people attending the launch. I wanted to say hi to everyone, so I worked my way around the room, grabbing a chair at one point to carry with me, and spoke to as many people as possible. There were plenty of CBC’ers who hadn’t seen one another in a while, and who were happy talking to one another, so I didn’t have to worry so much about them. But there were others who didn’t know anyone, and I wanted them to feel comfortable and welcome. Time flew by. At six-thirty it was time to head back to the library for the actual launch. Rushing to the library, we passed a homeless woman in rough shape who asked me for spare change. As I gave her some, I was struck by the difference in fortune between the two of us. I was enjoying what was shaping up to be one of the greatest nights of my life. She was living a nightmare. I didn’t know what to make of this disparity between us. I still don’t. Shortly before, in the Free Times Café, I had asked a friend who I hadn’t seen in years how she was doing. “It’s been an adventure,” she told me. “Lots of traveling?” I asked. She was chipper about it all, obviously not wanting to put a damper on the evening. She had endured all that and yet had come out to see me on this night. I really didn’t know what to say. Rushing back to the Merril Collection, thinking about the homeless woman and my friend, I wondered about enjoying good fortune while other people suffered. Of course, I experience extreme good fortune pretty much all the time relative to many people in this world simply by virtue of the circumstances of my existence. But the contrast seemed especially stark on this night, and I have thought about it a lot since. It bothers me. A subject for another entire essay. It was almost seven by the time I made it back to the Merril Collection. The place was already packed. Before I even got through the door, I was waylaid by friends who wanted me to sign their copy of the book. Other copies of my book had been neatly stacked on a table to sell. I signed a few on the edge of the table. Chris from Bakka-Phoenix Books was there doing the selling. Oliver Brackenbury from the Friends of the Merril Collection was there too. I thanked both of them for their help. An impromptu line formed for me to sign books. This surprised me—I had thought that I would have time to mingle before getting up to play the video and talk. I was just about to make myself comfortable signing books when Annette whispered in my ear that we had best begin the proceedings. I made my way to the front. Sephora began her introduction. Standing off to the side, I saw that the place was packed. Friends had driven from as far away as Omemee, Peterborough, and Niagara-on-the-Lake to be there. There were also quite a few faces I didn’t recognize. I was a little gobsmacked, and a lot grateful. Annette played the video from my laptop. First, Lorina Stephens, Publisher of Five Rivers Publishing, said a few kind words about me and my book. Then, Senior Editor Dr. Robert Runte told a couple of amusing stories about acquiring my book and editing it. Both went over well. I have a love/hate relationship with public speaking. Many times in my life I have been forced into situations where I have to deliver speeches or act as Master of Ceremonies. I can do it. Sometimes I even enjoy it, but it does not come naturally to me. As a teenager, I once hosted a variety show at my high school during which I could not even lift my eyes to meet the audience until the show was just about over. I was determined to get better at it, though. Eventually, I figured out that the key to success is preparation. I began thinking about my speeches days or weeks ahead, and rehearsing them mentally over and over until I had them completely memorized. I got reasonably good at it, until the day I completely botched a speech at work because I’d grown too cocky. I hadn’t bothered to prepare. Figured I could wing it. Seconds into my speech, in front of dozens of people, I realized that I had no idea what to say. It just got worse from there. On the plus side, I never failed to prepare for a speech again. So I was ready for this speech. I hadn’t completely memorized it, but I knew it well enough. The crowd was incredibly supportive, laughing at all the right places, and even a few places that surprised me. Afterward, Sephora ushered me over to a table that had been set up for me to sign books. She even gave me a special pen that she said other authors seemed to like. It was indeed a fine pen. A line formed, and I spent the rest of the evening signing books, taking long enough with each person to chat a little bit and attempt to personalize each signature. Even if I knew perfectly well who someone was, I asked them how to spell their name, just to be sure. I had thought I would have time to mingle afterwards, but it wasn’t to be. I signed books right up until the end. There were a lot of people who came that I didn’t get to talk to. I felt a little bad about that, but I think everyone understood. “You were pretty busy,” a friend reassured me later. We sold fifty-eight copies of A Time and a Place that night. Chris told me later that it made A Time and a Place the top selling Trade Paperback at Bakka-Phoenix books for the month of October. My deepest thanks to everyone who purchased copies. Finally, only a handful of us were left: Sephora, Annette, Chris, and my family. We took a few final pictures and said our goodbyes. Outside the library, mundane reality reasserted itself by playfully hiding our car. In the dark, my family and I didn’t recognize the narrow alley way down which we’d parked, and we walked well past it before finally clueing in and turning back. Still, it had been a brilliant night. Not a prelude to becoming a rich and famous author (neither the goal nor the expectation), but confirmation that I had friends, family, colleagues and acquaintances kindly disposed toward me, willing to give up an evening of their busy lives to help me celebrate. I would do the same for them.